It is estimated that 9 million people in the UK tuned in to watch Sherlock Holmes’ legendary and moving best man speech on BBC’s immensely popular Sherlock earlier this month. While we are still waiting to film a speech quite like this (OK, we admit, without the murder shenanigans would be better of course), we have filmed quite a number of very different speeches throughout the years. From very, very long ones to very very short ones. From ones riddled with original inside jokes to ones riddled with old and often used jokes… anything goes! What can we learn from Sherlock’s and other great speeches? * Bring props! From masks, to baby pictures of the groom, to… pets? * Make your jokes original! Oh and if you are wondering where Holmes’ wedding was filmed, read this great article on youandyourwedding.co.uk. 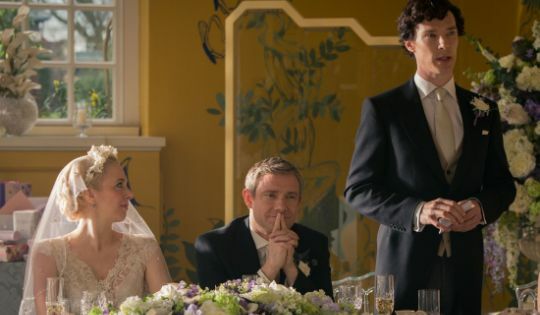 Sherlock Holmes gives a legendary best man speech at his best friend’s wedding. Courtesy of BBC.